I have a multiple choice quiz, where the user is given feedback, I need to show - their choice and if they were correct or not. 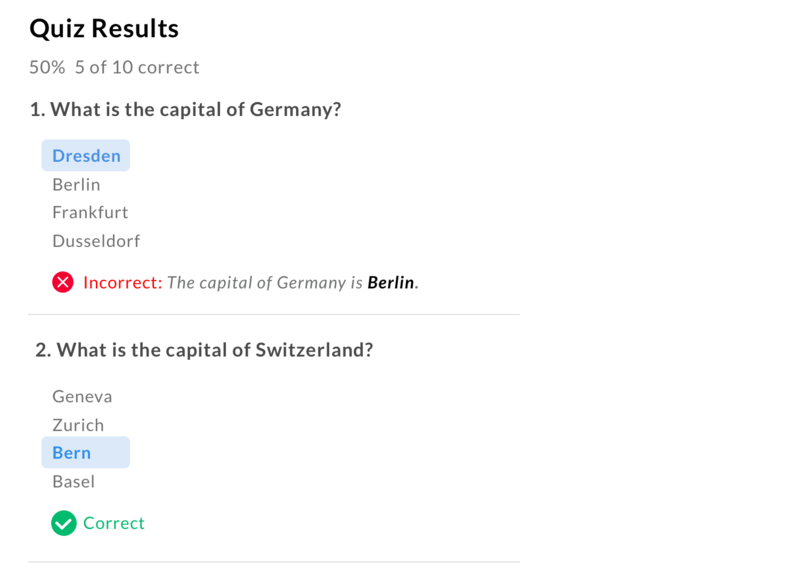 In this example the question was 'What is the capital of Germany'. I have tried lots of variations but have not really got something that works. Try saving the icons for the results, and use visual distinction to show their selection. You can separate the result and feedback right below the choices (with their selection). The feedback can use 2 levels of visual distinction: color and icon. For incorrect answers, show them the correct answer in close proximity to the feedback. Left to right movement for a negative choice. Top to bottom movement for a positive choice. And then: text-decoration: line-through for wrong answers. Not the answer you're looking for? Browse other questions tagged selection choices quiz or ask your own question. The myth of 7±2 options: more recent research?